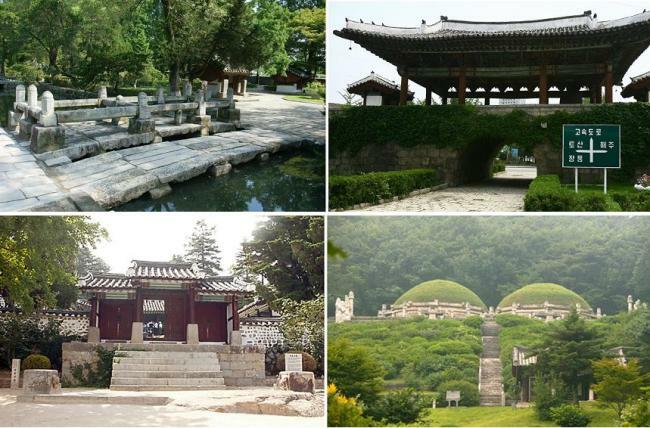 COREE DU NORD – Gaeseong - Historic monuments and sites of the Goryeo Kingdom (918-1392) in Gaeseong have been recommended for UNESCO World Heritage Site listing by a UNESCO affiliate. Those sites included in the recommendation by the UNESCO International Council on Monuments and Sites are: five separate sections of the Gaeseong City Wall; Manwoldae Palace archaeological site and the remains of the Gaeseong Cheomseongdae, an astronomical and meteorological observatory tower; Goryeo Seonggyungwan, an institute of higher learning; Sungyang Seowon, a private Confucian academy; Seonjuk Bridge and Pyochung Monuments; the Mausoleum of King Wanggeon with the associated Seven Tombs Cluster and Myeongreung Tombs Cluster; and the Mausoleum of King Gongmin. The council said the Gaeseong sites exhibited the assimilation of the cultural, spiritual and political values of the various states that existed on the Korean Peninsula prior to the Goryeo Kingdom, and the exchange of such values with other neighboring kingdoms over a period of five centuries. It also acknowledged that the sites were an exceptional testimony to the unified Goryeo civilization as Buddhism gave way to neo-Confucianism in East Asia. INDE – Tarighat - The excavation of the archaeological site at Tarighat, where a 2500-year-old city has been found to be buried, has yielded a treasure trove of gold coins and ornaments, triggering gold rush by locals in the area. “Large number of gold coins and ornaments like ear studs and nose rings belonging to Sarabha-purias, a ruling dynasty contemporary of Gupta period (4th-5th century AD) have been retrieved just 65 cm beneath the surface during excavation of the site. This is very remarkable discovery since for the first time gold coin of ruler Mahendraditya was found in an archaeological site in Chhattisgarh,” J.R.Bhagat, deputy director of the state archaeology department, said here on Monday. 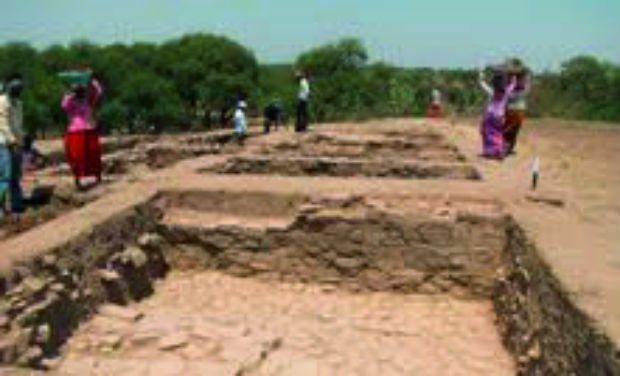 However, archaeologists in-charge of excavation of the site have refused to divulge as to exactly how many gold coins and jewelleries have been recovered for security reasons. All of them are one sided minted coins. While one of the gold coins mentions the name of the ruler of the then period Prasannamatra, another gold coin mentions the name of another ruler Mahendraditya in Brahmi script. On the top of the each coin signs of weapons of Lord Bishnu like ‘Chakra’ (disc), and ‘Shankha’ (cell) and his vehicle ‘Garuda’ have been depicted. The excavation has also brought to fore a well-planned township buried under earth. Only one third portion of a 7-meter-long mound has been excavated thus far. 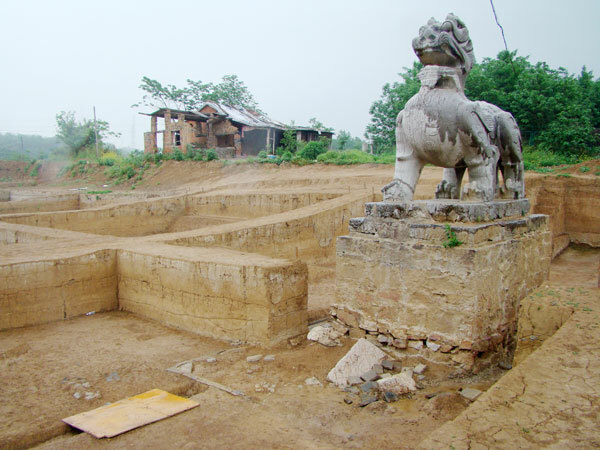 CHINE – Xinhe - A museum in Nanjing, Jiangsu province, has suspended the excavation of what is thought to be an imperial mausoleum following protests from archaeologists and the public. The department of archaeology at the Nanjing Museum admitted it plans to build a heritage park and a museum on the site of the mausoleum, and said it will further consult experts before putting forward new protection measures. 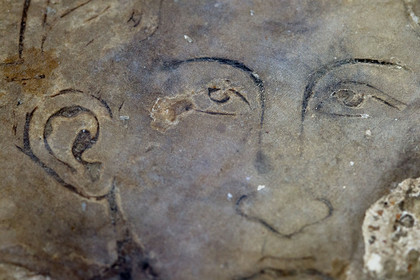 In November, archaeologists from the Nanjing Museum discovered two 16-by-7-meter tombs in Xinhe, a village in the city's Qixia district. The tombs were later suspected to be the mausoleum of Chen Qian, the second emperor of the Chen Dynasty (AD 557-589), which is also known as the Southern Chen Dynasty. In January and February, the Nanjing Museum and the city's cultural, radio, press and publishing bureau held two news conferences announcing the construction of a heritage park and a museum that will occupy 80,000 square meters. In the late 1950s, Beijing excavated the mausoleum of Emperor Wanli and his two queens of the Ming Dynasty (AD 1368-1644). But due to the limited technology of the conservation and recovery of unearthed relics, large amounts of the artifacts, especially textiles, were destroyed. Soon after the excavation of Wanli's mausoleum, the State Council said that imperial tombs may not be excavated. In 1987 and 2012, the State Council again said that the safety of cultural relics is the most important and imperial tombs should remain undisturbed, according to Yao Yuan, a cultural scholar from Nanjing University. "The establishment of any cultural program is no excuse for digging into an imperial mausoleum," Yao said. FRANCE – Gonesse - Après plusieurs mois d'interruption, la fouille a repris au sein de l’église Saint-Pierre-et-Saint-Paul de Gonesse (Val-d'Oise). Trois niveaux de sol viennent d'être dégagés, révélant une quarantaine de sépultures du XVIIIe siècle et les fondations de l'édifice actuel. TURQUIE – Yenikapi - Heavy equipment belonging to a construction firm that is working on the long-expected Marmaray project -- an undersea commuter train connecting İstanbul's Asian and European sides -- invaded an excavation site in Yenikapı and has damaged remnants dating back to the Neolithic Age. Archaeological excavation started in 2004 at the Yenikapı Marmaray construction site, reaching 8,500 years into the history of İstanbul. 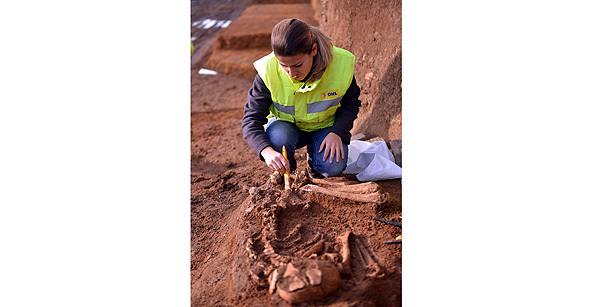 Skeletons, chapel remains, water wells, footprints, the world's best-preserved shipwreck and a merchant vessel, whose contents and wooden parts are in exceptionally good condition, have been uncovered by archaeologists so far. The excavations are still going on at the site, but the Marmaray construction firm interrupted the work when its heavy equipment invaded the excavation site on May 11, not thinking of any possible damage that it might cause to objects as yet unrevealed.